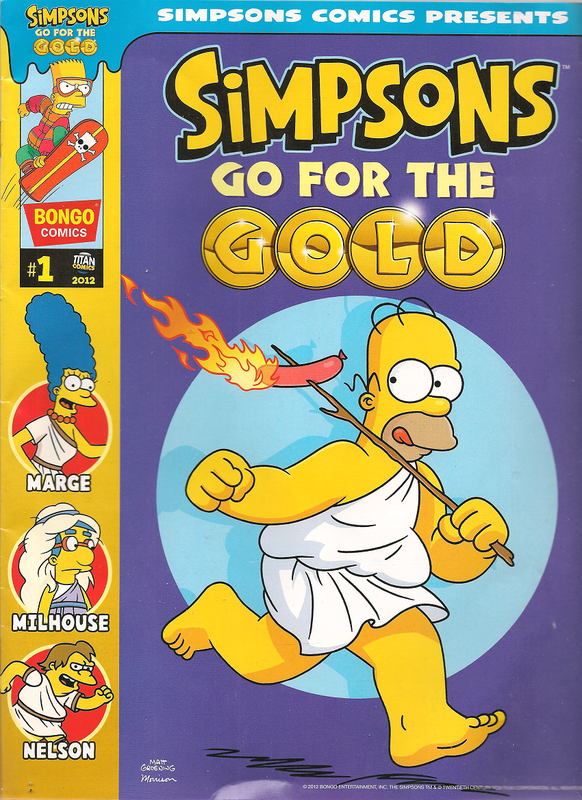 A number of comics based on The Simpsons created by Bongo Comics Group have been published in the United Kingdom; only one of which is still going along with an annual every year. These are published by Titan Magazines. Simpsons Comics Volume II August 24, 2017 Ongoing The main series based on the US Simpsons Comics. 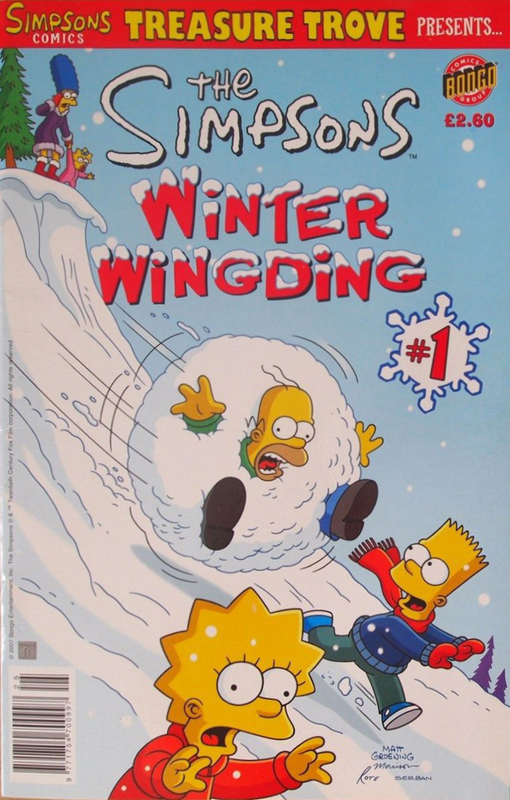 Simpsons Comics February 24, 1997 June 8, 2017 The main series based on the US Simpsons Comics, Bart Simpson's Treehouse of Horror, Bartman, Itchy & Scratchy Comics, Krusty Comics, Lisa Comics, Radioactive Man, Simpsons Comics and Stories, The Simpsons Winter Wingding #1 & The Simpsons Winter Wingding #2 are also included in this run. Bart Simpson (UK) August 24, 2001 September 12, 2013 Based on the US Bart Simpson, Bartman, Krusty Comics & Radioactive Man, the series was eventually replaced with Bart & Co. 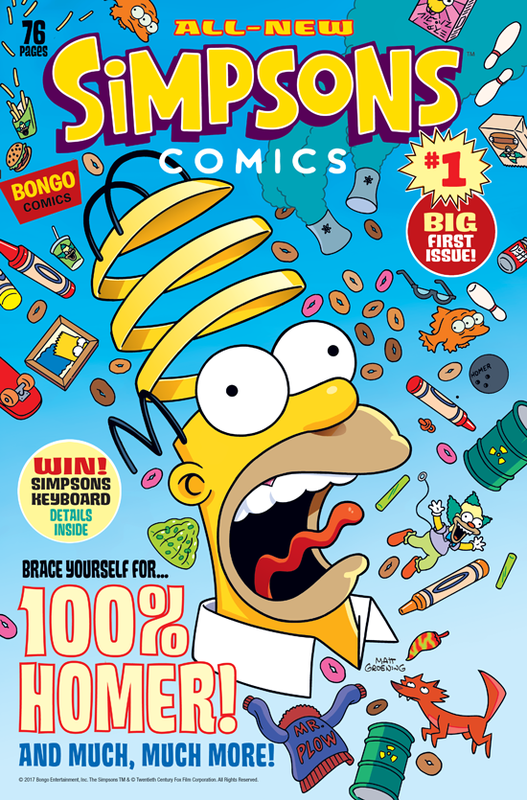 The Best of The Simpsons (UK) April 3, 2003 October 10, 2013 The series published comic stories from old Simpsons Comics, Itchy & Scratchy Comics#3 & Bartman#3 releases, the series was eventually replaced with Bart & Co. The American equivalent, Simpsons Classics later began in 2004. Simpsons Super Spectacular (UK) May 25 2006 January 1, 2013 Based on the US Simpsons Super Spectacular. The series retired alongside its American equivalent. Simpsons Comics Treasure Trove July 12, 2007 June 12, 2008 Based on the short-lived US Simpsons Comics Treasure Trove. Simpsons Summer Shindig (UK) August 9, 2007 July 10, 2008 This series is based on the US The Simpsons Summer Shindig. 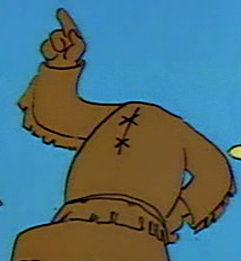 The series was merged into Simpsons Comics after the first two issues. The Simpsons Winter Wingding #1 November 29, 2007 November 29, 2007 This series is based on the US The Simpsons Winter Wingding. The series was merged into The Simpsons Annuals after the first issue. The Best of Bart Simpson (UK) April 2, 2009 April 25, 2013 In the same way as The Best of The Simpsons, the series published old comic stories from Bart Simpson,the series was eventually replaced with Bart & Co.
Simpsons One-Shot Wonders August 8, 2013 September 10, 2015 Now appearing regularly in Bart & Co., the series has a mini pull-out comic with stories centering around one character in Springfield. 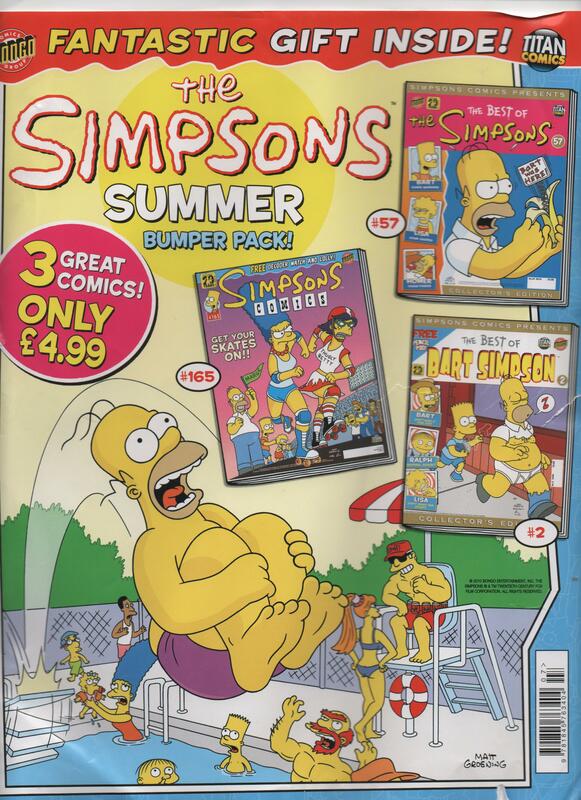 Instead of Harpercollins Entertainment, Titan Books publishes almost all of the Simpsons Comics Trade Paperbacks in the UK, with the seasonal compilations and Simpsons Comics Royale being the only exceptions to this. Between July - December 2007 the average circulation was 133,086 copies per issue. Modified on January 20, 2018, at 11:51.